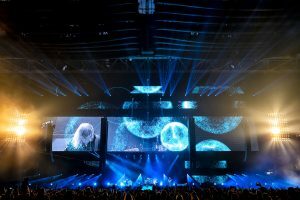 Lighting supplier Phlippo had four enormous custom manually operated follow spots made for the back of the stage, where they were positioned on the floor each featuring a 6×6 matrix of ACL bulbs. The 58 x Robe BMFL Spots were his primary effects lights. 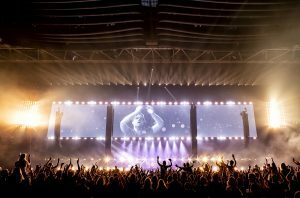 “I wanted BMFLs because it’s a stadium, so I needed the brightest light source available, and the one that was the most versatile to keep everything moving! There was only one choice!” That most of the show was in daylight was another factor. For curfew reasons they had to finish at 11 p.m. so the first half of the show saw plenty of natural lumens still flooding into the ArenA. So BMFL Spots provided those very special lightsources that impacted even with all that natural light and the LED wall in the space. 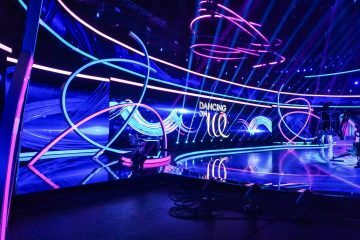 BMFLs were rigged in four rows in between the primary LED screen and its four border banner strips – giving him two dynamic low volleys and two high ones … of powerful, precise, eye-popping profiles. The 129 x Spiiders were divided between the central 12-metre-wide performance area – above and below the screen elements for a big battery of powerful wash and beam fixtures immediately behind the band. The rest were deployed on the floor and around the sides of the stage to cross light the band from a mid-stage location. They were chosen again for their power and the excellent colour mixing in particular the white variants. Michiel used a lot of whites in the show … the crisp acuracy of the Spiider’s daylight blues making a perfect contrast to the warm organic glow of the tungsten elements. 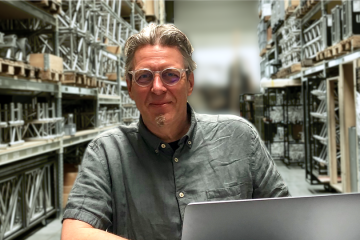 “They are an excellent light – I love them” stated Michiel, who first started using Robe products when the LEDWash 300 was launched. “It was the first LED wash light that ever really worked properly, and Robe have gone from strength-to-strength in producing refined, beautiful and highly effective LED washes ever since, culmination with the Spiider” he declared. He also made the most of the Spiider’s narrow beam capabilities on the Kensington show, and was very satisfied with how everything looked, especially the daylight sections. He utilised seven BMFL Follow Spots – also a first for him using Robe’s remote follow-spotting RoboSpot system. In addition to these, he had another 11 conventional manually operated follow spots dotted around the room and over the stage. 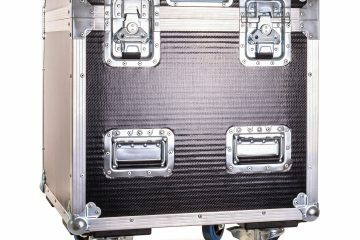 The main stage lighting console was another grandMA2 operated by Dimi Theuwissen. With most of the show running to timecode from the band, Michiel called all 18 follow spots. A grid of 160 spot moving lights in the centre behind the band, came in and out four times during the set, and there were also over 100 other wash lights on the rig plus 75 strobes. Michiel really enjoyed the scope of working on a large show. 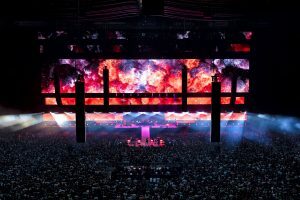 He praised promoter Friendly Fire under the direction of Marcel Buurman, and technical production manager Harold Opmeer from iTecca, for allowing a decent amount of time for the get-in, technical time and fine tuning on site. “It’s seen a very positive and fertile collaboration between all departments, with a lot of trust between all working for a spectacular common goal”. The real creative challenge was getting a harmony between all the lighting and video sources for a one-off show. Nexxt Technology also commissioned and provided the video content, while the IMAG mix was live directed by United Multicam director, Johan Veerman. The service and support from Phlippo were “brilliant as always” says Michiel. Taking care of the account from the office / warehouse side was Sven de Boer and the Phlippo lighting crew chief on site was Dennis Debrabandese. Phlippo also provided Stijn Lauwereins who was dedicated to tech’ing the RoboSpot system, including training up seven local crew as operators … which they picked up very quickly. The show was exceptionally well-received and concluded this long and productive album cycle on a high note, giving Kensington the memorable send-off they wanted as they head back to the studio to focus on new recording work.